Busted my budget again! I just couldn’t resist these samplers that were on sale for very low prices on the Facebook stash group. These have been on my wish list for a long time and I had been resisting buying them because I am not going to stitch them right away. But they were irresistible at these prices. 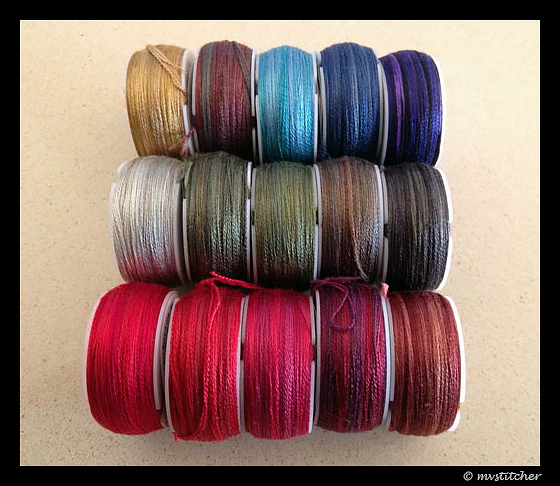 I also bought more HDF silks, but have not received them yet. 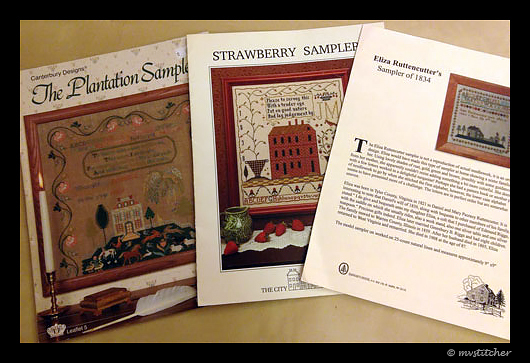 Three samplers that are not reproductions. I love the houses in all of them. I started a small pattern as a gift for my aunt – pattern is from my freebie pile, and the fabric and floss are all from my stash. I will post details once I finish. Here are my purchases this month – both from the aforementioned Facebook group. 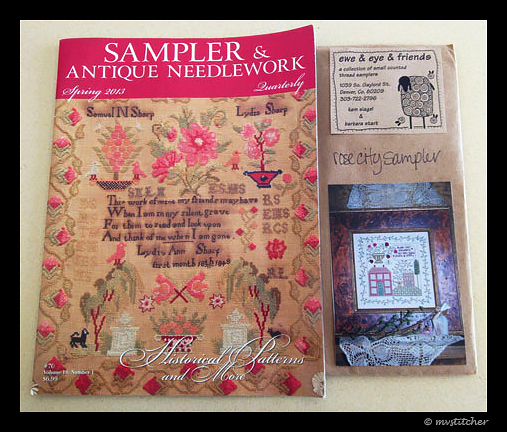 I could not resist the Lydia Sharp sampler in the Spring 2013 issue of the magazine. I love the colors, the slightly morbid verse, the oversized flower, the trees, birds, and the two animals below the trees. This is another sampler where I don’t like the colors in the reproduction (inside the magazine) and I will have to choose colors to match the cover photo. The second pattern attracted me because of the border, the pink house, the ribbon roses on the top, and the specialty stitches. 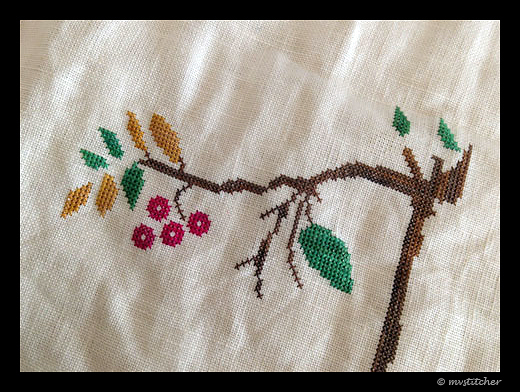 I had been wanting to stitch a Carriage House Samplings pattern for the longest time. I had bought a whole stack of her patterns when she announced her retirement a couple of years ago, and they just sat there while I stitched other things. I finally started The Birds & the Bees last weekend. I am really enjoying it right now, although I am sure I will be complaining about the million leaves and fruits at some point (the full design can be seen at the top of this page). It’s not even one full month into 2014 and I am straying from my goals already, but whatever. 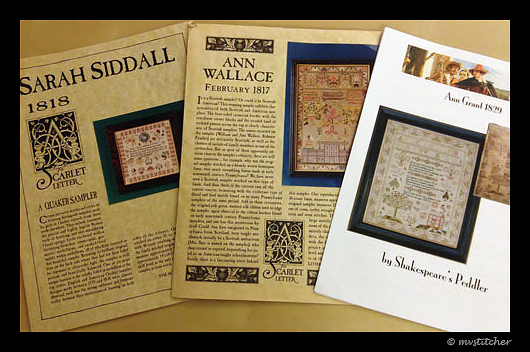 This is a free SAL that is being offered by Annalies and Simone, the lovely Dutch ladies at Soed Idee (read all about it here). I could not pass it up because this was an opportunity to do a big project in just TWO colors, which is a nice change from the zillion colors in Ann Dale. 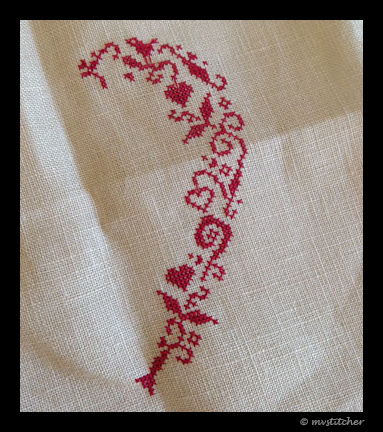 Moreover, this design is perfect to for the 36×40 uneven linen in my stash that I have been dying to use for a long time. 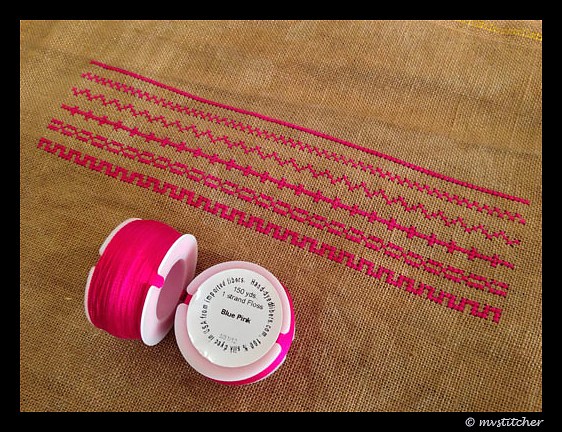 I auditioned a lot of floss colors for this one and finally settled on a deep, rich pink. The linen choice was easy because I had only one piece that was long enough to fit all the 106 bands.